Any metal blade operates far better if it's well oiled. It will cut smoother, faster, quieter and for much longer. Failure to oil regularly will cause the blades to become blunt and far less effective. Essentially, oil is critical for any shredder! 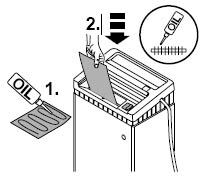 As a rule of thumb, we recommend you oil your shredder each time you empty the waste bin or sack, although after heavy use it doesn't hurt to oil it. To oil, simply squirt some of the oil onto a sheet of paper (as shown) and shred this through as normal. It's that simple, and it will make the world of difference to your shredder's efficiency and life-span.